Reacquired by the Navy, 7 April 1942, from the Coast and Geodetic Survey at Norfolk, VA.
Decommissioned, 22 September 1944, at San Pedro, CA. 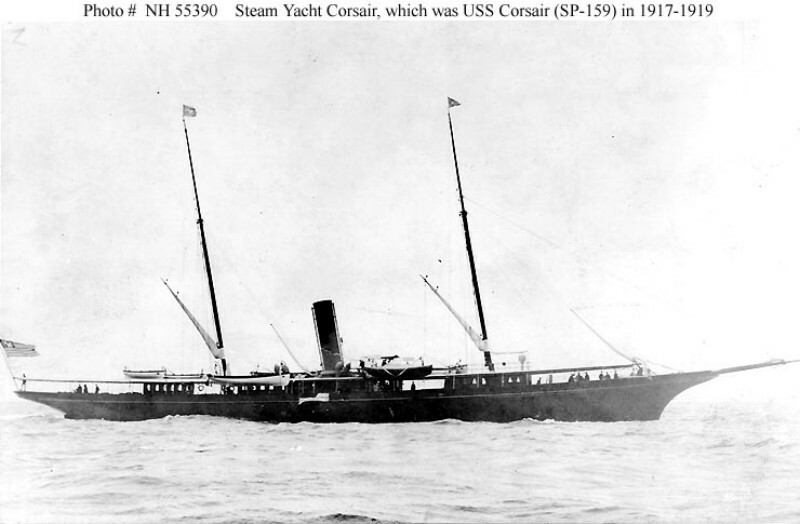 66k The steam yacht Corsair (III) photographed prior to her World War I Naval service. 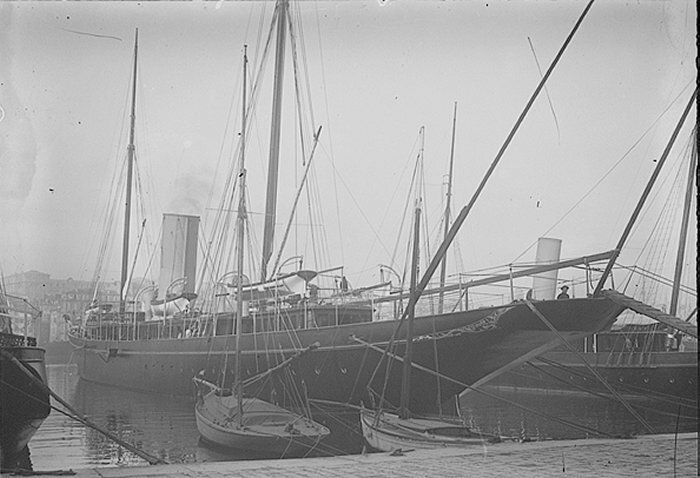 39k The steam yacht Corsair (III) photographed by Edwin Levick of New York City, prior to her World War 1 Naval service. The original print is in National Archives' Record Group 19-LCM. 54k USS Corsair (SP-159) fitting out for WW I service, circa May 1917. 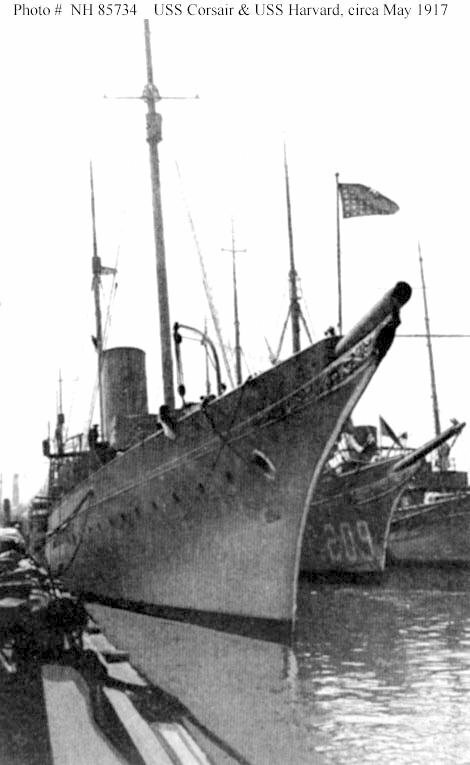 Ship outboard is USS Harvard (SP-209). 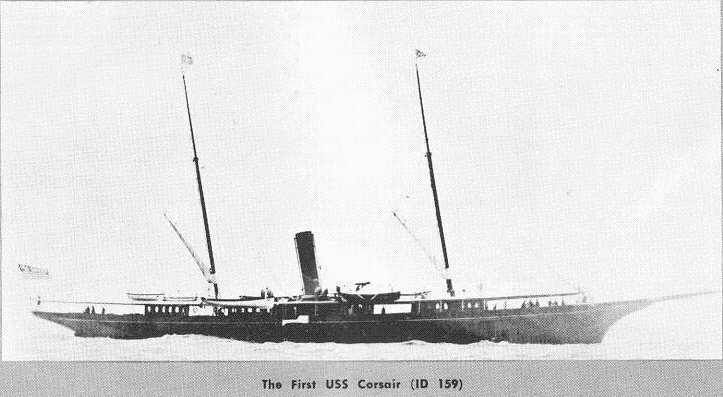 74k USS Corsair (SP-159) under way, date and location unknown. US Navy photo from "All Hands magazine, November 1967 issue. Joe Radigan MACM USN Ret. 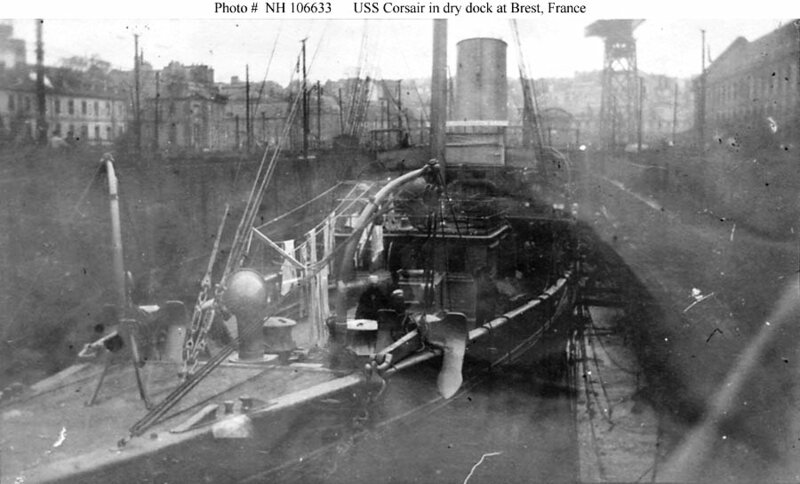 85k USS Corsair (SP-159) in dry dock at Brest, France, circa 1918. 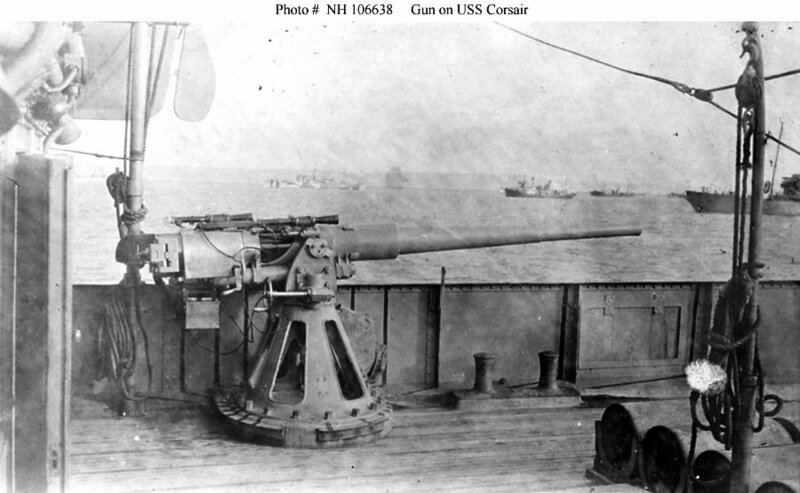 87k USS Corsair (SP-159)'s number three 3"/50 gun, circa 1918. 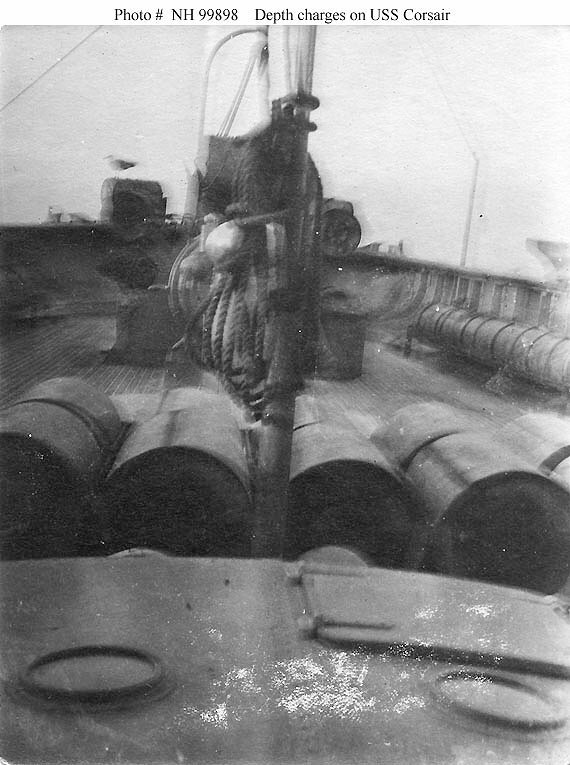 Several depth charges are stowed on deck in the lower right. The converted yacht patrol vessel partially visible in the right distance is USS Aphrodite (SP-135). 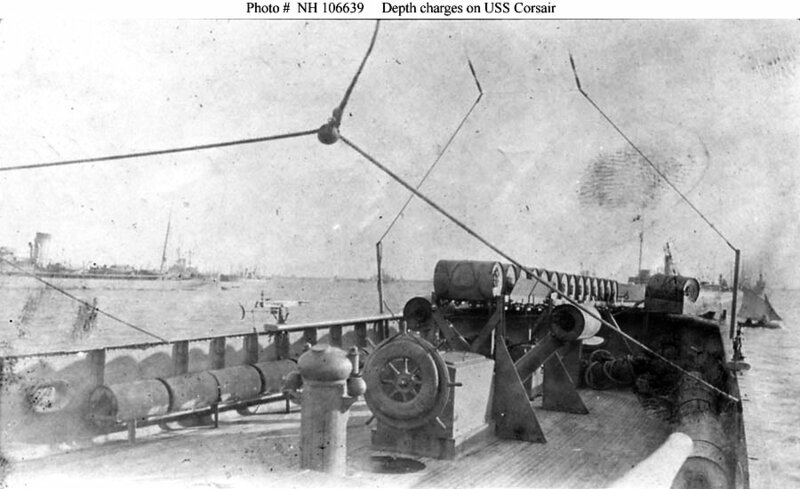 86k View of USS Corsair (SP-159)'s depth charges carried on the ship's after deck, circa 1918. Note the after steering wheel and binnacle in the center, with a "Y"-Gun depth charge projector just beyond. A Colt machine gun is mounted on the deck edge bulwark in the left center. 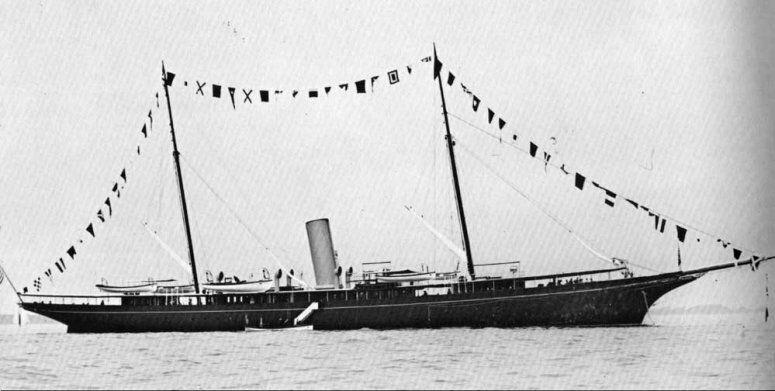 The converted yacht patrol vessel partially visible in the left distance is USS Aphrodite (SP-135). 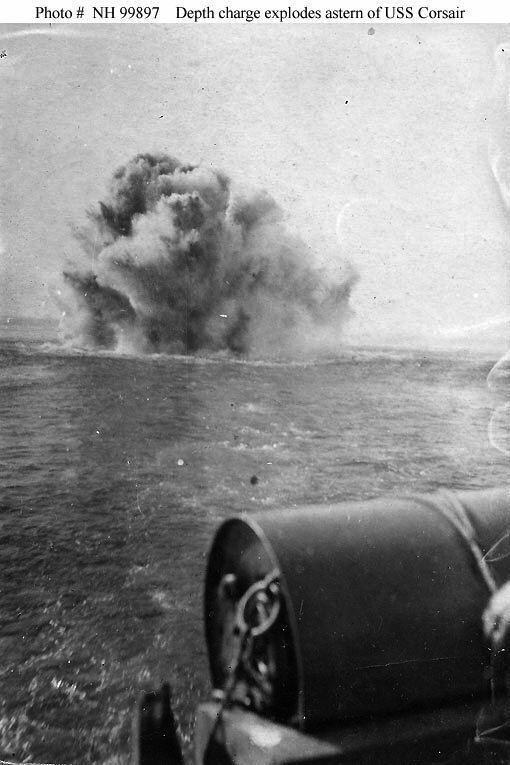 69k A depth charge explodes astern of USS Corsair (SP-159) during operations at sea in 1918. Another depth charge is visible in the foreground. 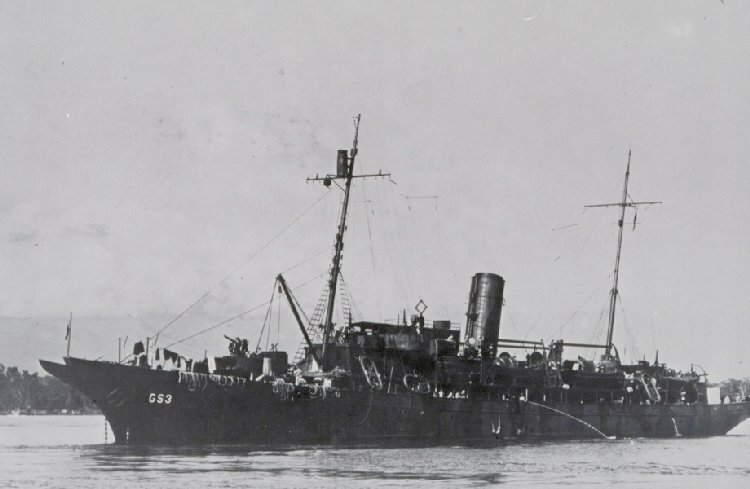 86k Depth charges stowed on the deck of USS Corsair (SP-159) during anti-submarine operations in 1918. 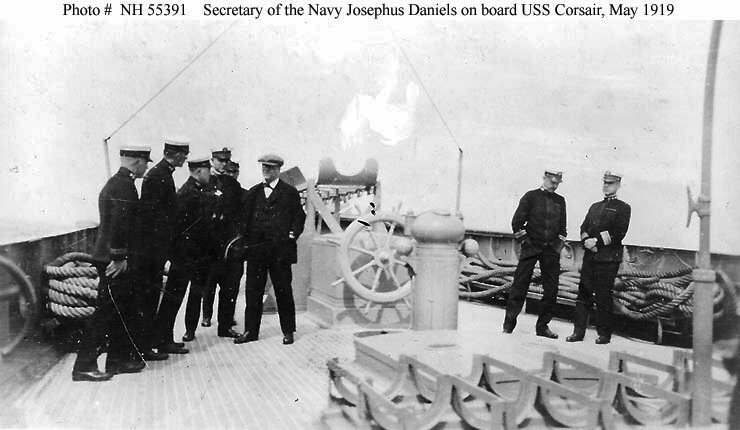 59k Secretary of the Navy Josephus Daniels (standing to left of the ship's after conning station) talking with a group of officers, while USS Corsair (SP-159) was at Plymouth, England, in May 1919. 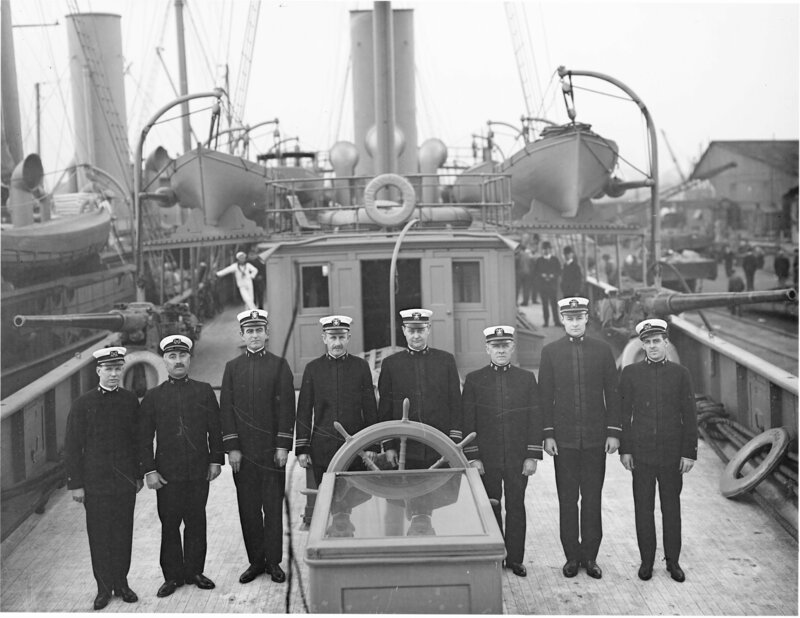 Standing at right are the ship's Commanding Officer, LCDR. William B. Porter, USNRF, and RADM Ralph Earle, USN. Note depth charge stowage racks in the foreground. 296k USS Corsair (SP-159) crew photo, circa May 1917-June 1919, New York Navy Yard, Brooklyn New York. 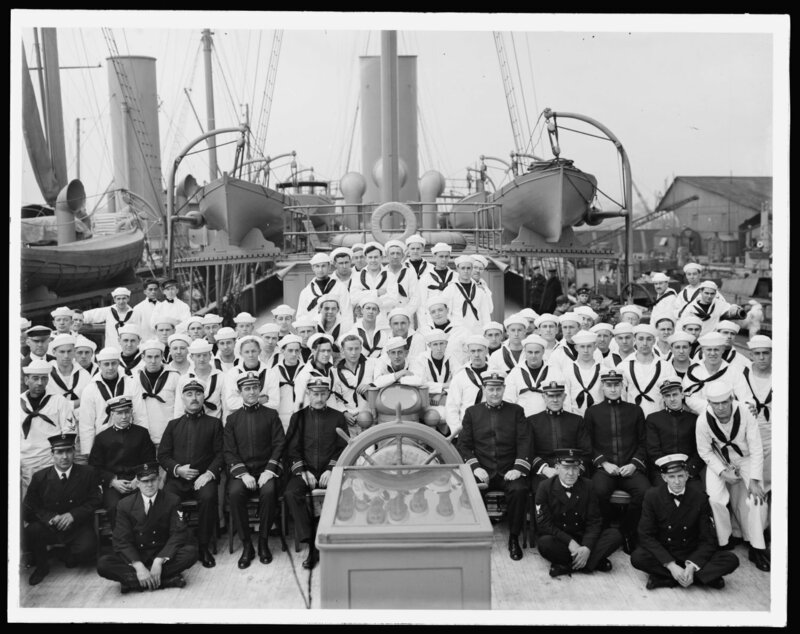 781k USS Corsair (SP-159) officers, circa May 1917-June 1919, New York Navy Yard, Brooklyn New York. 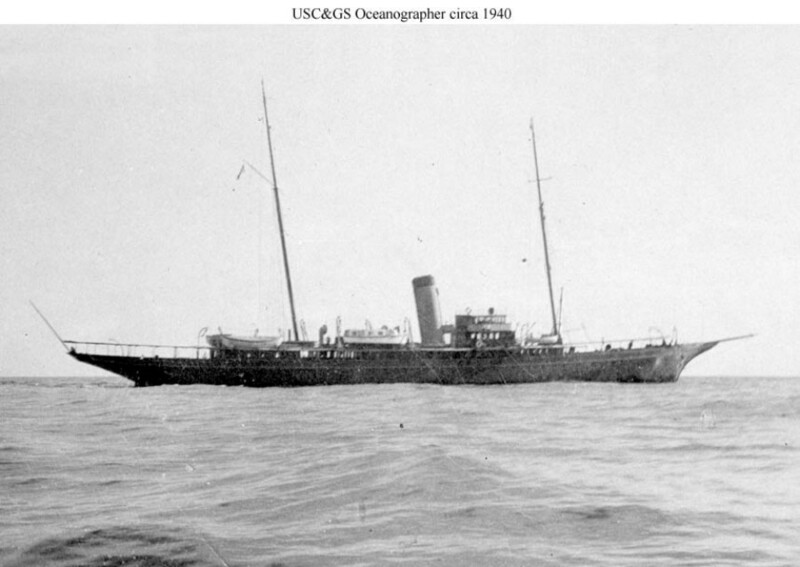 45k USC&GS Oceanographer (OSS-26) under way, date and location location. 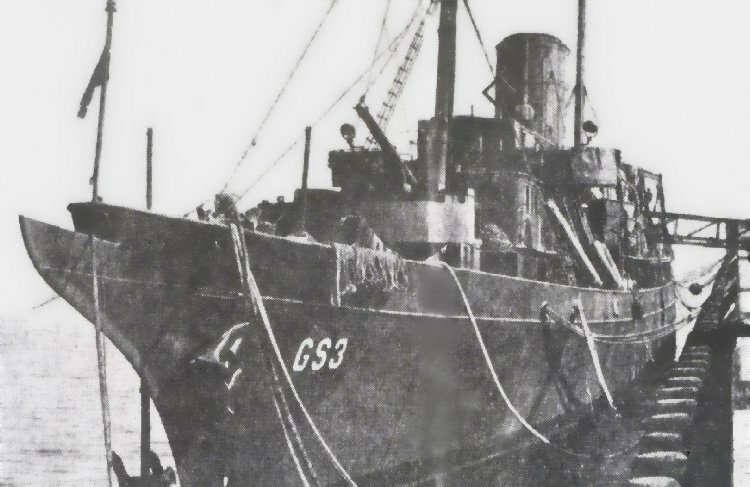 93k USC&GS Oceanographer (OSS-26) in service with the Coast and Geodetic Survey circa 1940. 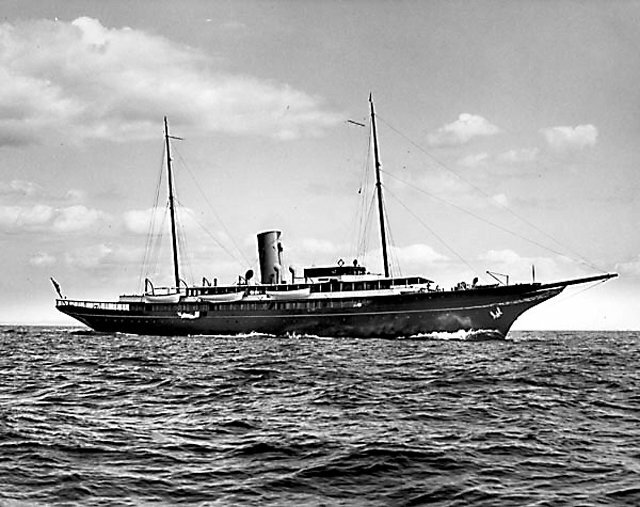 The Coast and Geodetic Survey appears to have enlarged her bridge after acquiring her from J. P. Morgan in 1930. 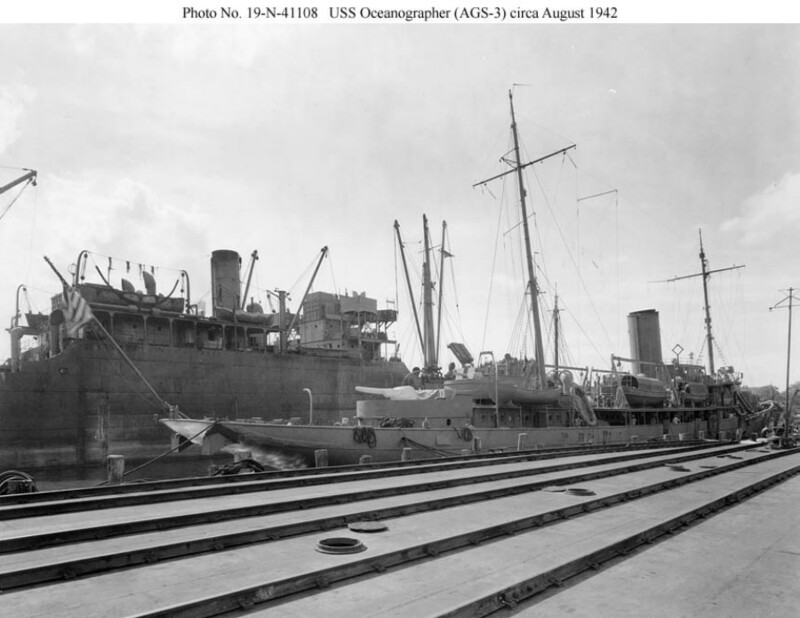 93k USS Oceanographer (AGS-3) moored at Norfolk, VA., circa August 1942 after conversion at Norfolk, VA.
114k USS Oceanographer (AGS-3) moored pierside, at Norfolk, VA., circa 1943.